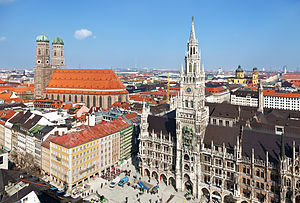 'S e baile uabhasach mòr ann an ceann a deas na Gearmailte a th’ ann am München (IPA:ˈmʏnçən, Eadailtis: Monaco de Baviera, Beurla/Fraingis/Spàinntis: Munich, Pòlais: Monachium). Tha e suidhichte aig 518m os cionn ìre na mara ri taobh na h-aibhne Isar, anns an stàit Bayern, aig 504km air falbh bho Bherlin, 195km bho Stuttgart agus 612km bho Hamburg. ‘S e Kreisfreie Stadt neo baile neo-eisimeileachd a th’ ann agus tha 16 oilthighean an seo. Tha 1,330,440 duine a' fuireach anns a’ bhaile, leis gur e an treas baile as motha na dùthcha. B' e prìomh-bhaile Rìoghachd Bayern a bh' ann. Chaochail an sgrìobhadair Paul Johann Ludwig von Heyse ann am München ann an 1914 agus Alistair MacLean ann an 1987. ↑ “Twin and Partner Cities”. Comhairle Baile Dhùn Èideann. Air a thogail 14mh dhen Ògmhios 2018. Air a tharraing à "https://gd.wikipedia.org/w/index.php?title=München&oldid=542628"
Chaidh an duilleag seo a dheasachadh 14 dhen Ògmhios 2018 aig 06:53 turas mu dheireadh.